Lyons Press. Hardcover. VERY GOOD. Light rubbing wear to cover, spine and page edges. Very minimal writing or notations in margins not affecting the text. Possible clean ex-library copy, with their stickers and or stamp(s). Globe Pequot Press, The, 2006. Hardcover. Good. Disclaimer:A copy that has been read, but remains in clean condition. All pages are intact, and the cover is intact. The spine may show signs of wear. Pages can include limited notes and highlighting, and the copy can include previous owner inscriptions. At ThriftBooks, our motto is: Read More, Spend Less.Dust jacket quality is not guaranteed. Globe Pequot Press, The, 2006. Hardcover. Very Good. Disclaimer:A copy that has been read, but remains in excellent condition. Pages are intact and are not marred by notes or highlighting, but may contain a neat previous owner name. The spine remains undamaged. At ThriftBooks, our motto is: Read More, Spend Less.Dust jacket quality is not guaranteed. Lyons Press. Hardcover. 1592289312 Ships promptly from Texas. . Fine. 2006. Globe Pequot Press, The, 2006. Hardcover. As New. Disclaimer:An apparently unread copy in perfect condition. Dust cover is intact; pages are clean and are not marred by notes or folds of any kind. At ThriftBooks, our motto is: Read More, Spend Less.Dust jacket quality is not guaranteed. Lyons Press. Hardcover. 1592289312 Great used condition. A portion of your purchase of this book will be donated to non-profit organizations. Over 1,000,000 satisfied customers since 1997! We ship daily M-F. Choose expedited shipping (if available) for much faster delivery. Delivery confirmation on all US orders. . Very Good. 2006-06-01. U.S.A.: Lyons Press, 2006. normal wear---------------14 amazing and true stories. Hard Cover. Very Good/Very Good. 8vo - over 7¾" - 9¾" tall. Lyons Press, 2006-06-01. Hardcover. Good. Book is in good condition, dust cover has minor wear along the edges. U.S.A.: Lyons Press, 2006. light wear o/w very clean copy--------Fourteen true, amazing and isspiringstories of some of the bravest mean and women your'll ever meet.. Hard Cover. Very Good/Very Good. 8vo - over 7¾" - 9¾" tall. Lyons Press, 2006-06-01. Hardcover. Good. Guilford, CT: The Lyons Press, 2006. 3rd Printing. Hardcover. Near Fine/Near Fine. 8vo - over 7¾ - 9¾" tall. The Lyons Press, Guilford, CT. 2006. Hardcover. 3rd Printing. Book is tight, square, and unmarked; former owner name on top of FFFP. Book condition: Near Fine; slight edgewear at head and heel of spine. DJ: Near Fine; one closed tear at spine, wear on top tips, bumping at head and heel of cover at spine. Blue boards and spine with bright red lettering on spine. 260 pp. Fourteen true, amazing, and inspiring stories of some of the bravest men and women you'll ever meet. This book captures the unsung heroism of the helicopter rescue service swimmers of the USCG. These stories are some of the greatest maritime rescues attempted since the program began in 1975. A very presentable copy in Brodart Mylar. Guildford, CT: Lyons Press. Fine in Fine dust jacket. 2006. Third Printing. Hardcover. 1592289312 . Photographs; 0.9 x 9 x 6.1 Inches; 260 pages . Lyons Press, 2006-06-01. Hardcover. New. There is very little shelf wear. The binding is in good shape. The pages of this book are clean and unmarked. A good solid copy. FAST SHIPPING & FREE TRACKING! Lyons Press, 2006. Hardcover. Fine/Fine. Blue cloth covers with light blue photographic Dj. Signed by author on title page. 9 x 6.1 x 0.9 inches with 260 pp. Guilford, Conn: Lyons Press, 2006. First Edition; Third printing. Hardcover. A fine clean copy in a fine DJ. Octavo in a sky blue DJ ; xii, 260 p : illus ; 24 cm. 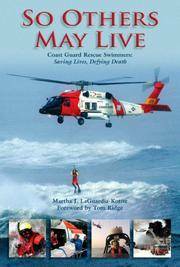 Detailed stories and photos of heroic water rescues // United States -- Coast Guard -- Search and rescue operations -- History. Lyons Press, 2006-06-01. Hardcover. Used:Good. Lyons Press. Hardcover. 1592289312 Like New Condition. . Fine.